August is Perseids Time!!! GO OUTSIDE!!! The Perseid meteor shower is underway as Earth enters a stream of debris from giant comet 109P/Swift-Tuttle. International observers are reporting as many as 20 meteors per hour from dark-sky sites--rates that could increase 5-fold by the time the shower peaks this weekend. The best time to look is during the dark hours before sunrise on Sunday, August 12th, and again on Monday, August 13th. At those times, the shower's radiant will be high in the sky, spewing meteors in all directions. Don't forget... stay safe outside and wave at a meteor for me, please!! 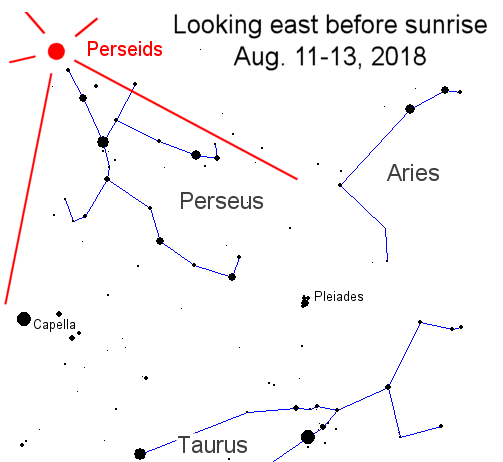 Re: August is Perseids Time!!! GO OUTSIDE!!! Apparently there's a partial solar eclipse today, but unless you're Santa Claus you won't be seeing much of it. I saw a shooting star on Saturday evening. It was magnificent! !